I m an English teacher from Argentina, but living in Spain now. I ve been teaching for twenty years and I do love what I do! We ve got a great job! Thank you all for such extraordinary worksheets! This is the first worksheet of a set of seven. It introduces present continuous through these nice Sesame Street characters. (Fonts of the title are not the same as in the original; sorry! )There´s also a memory game, domino and bingo that I had to upload separatedly because of size. 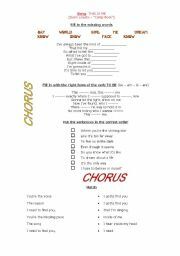 I hope you like my worksheets! This is the third worksheet of a set of seven that introduce present continuous through these nice Sesame Street characters. These are cards that can be used as a domino, memory game or simply as a matching-pair activity. 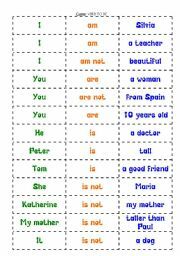 (See also the other worksheets of the series)I hope you like it! 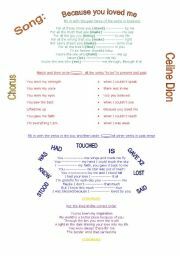 A very nice song to practice PAST SIMPLE of regular or irregular verbs. 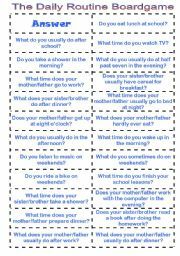 There´s a second worksheet with follow-up activities focused on vocabulary (OPPOSITES) and some grammatical structures. This is the second worksheet of a set of seven that introduce present continuous through these nice Sesame Street characters. 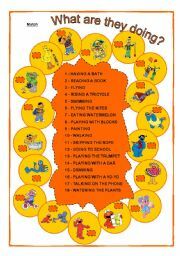 (See also my other worksheets that complete the series: matching, domino, memory game and bingo) I hope you like my worksheets! Students get hooked with this song. There are actually two versions of this song sung by Demi Lovato: the popular one which also appears in the film ("Camp Rock) and an acoustic version. The latter version is a little slower than the other one and gives better results when doing the listening exercises with lower level students. Hope you enjoy it! 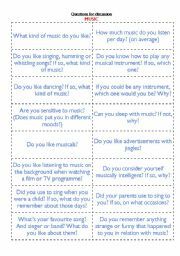 Great questions for a debate on the topic of music. Good for a conversation class or simply to introduce the topic. 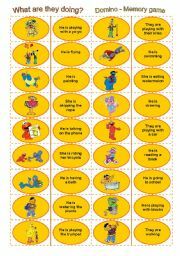 This is the second bingo worksheet that comes with a set of other worksheets that introduce present continuous through these Sesame Street characters. I sent worksheets 1, 2 and 3 yesterday. There are two more bingo sets and also the teacher´s sheet included in the third bingo set. I hope you like them! This is the fourth worksheet of a set of seven that introduce present continuous through these nice Sesame characters. I sent worksheets 1, 2 and 3 yesterday. There are two more bingo sets and also the teacher´s sheet included in the last bingo sheet. I hope you like them!